Two days after launching from the steppe of Kazakhstan, a Russian Progress resupply and refueling freighter docked with the International Space Station Sunday. The Progress MS-10 spacecraft lifted off Friday from the Baikonur Cosmodrome atop a Soyuz-FG rocket in pursuit of the space station, kicking off a series of orbital adjustment maneuvers to approach the research outpost. 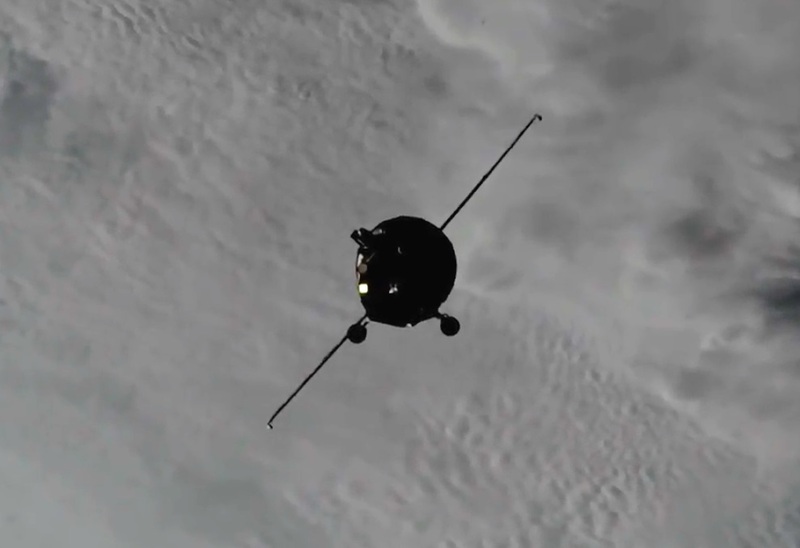 The supply ship’s radar-guided rendezvous is expected culminated in an automated docking with the aft port on the space station’s Zvezda service module at 2:28 p.m. EST (1928 GMT) Sunday, delivering around 5,500 pounds (2,495 kilograms) of supplies, experiments and commodities for the orbiting outpost and its crew. 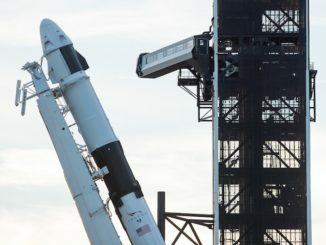 “That’s only act one of a 24-hour, two-part act of delivery runs to the International Space Station,” said Rob Navias, commentator for NASA TV’s broadcast of the Progress docking Sunday. The Progress docking is the first of two supply ship arrivals planned at the space station in less than 15 hours. 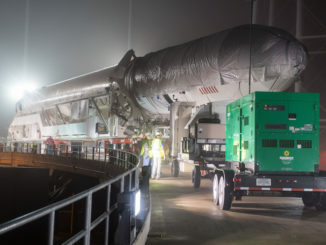 A commercial Cygnus cargo vehicle built and operated by Northrop Grumman launched Saturday from Wallops Island, Virginia, and is scheduled to be captured by the station’s robotic arm at 5:20 a.m. EST (1020 GMT) Monday. A breakdown of the Progress MS-10 spacecraft’s manifest released by Roscosmos — the Russian space agency — indicates the mission carries 2,866 pounds (1,300 kilograms) of dry cargo — food, clothing, provisions, experiments and spare parts. Those items will be manually unloaded by the station crew. 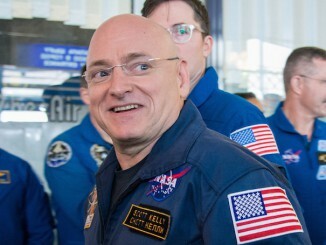 The Progress also carries tanks containing around 1,598 pounds (725 kilograms) of propellant for transfer into the Zvezda module’s propulsion system, 925 pounds (420 kilograms) of water, and 112 pounds (50 kilograms) of compressed air and oxygen to replenish the atmosphere on the station. The launch Friday of the Progress MS-10 supply ship was the first flight of the Soyuz-FG variant of Russia’s venerable Soyuz rocket family since a failed launch Oct. 11 led to the emergency landing of a two-man crew minutes after liftoff from Baikonur. Russian commander Alexey Ovchinin and NASA flight engineer Nick Hague safely landed downrange in Kazakhstan after a malfunction during separation of one of the Soyuz first stage boosters. The successful Soyuz-FG launch cleared the way for the liftoff Dec. 3 of the next station crew, led by veteran Russian cosmonaut Oleg Kononenko with Canadian flight engineer David Saint-Jacques and NASA astronaut Anne McClain, both spaceflight rookies. The trio will launch on a Soyuz from Baikonur on an expedited six-hour rendezvous with the station, beginning a 17-day handover with six residents aboard the research outpost before the current three-person crew returns to Earth on Dec. 20.